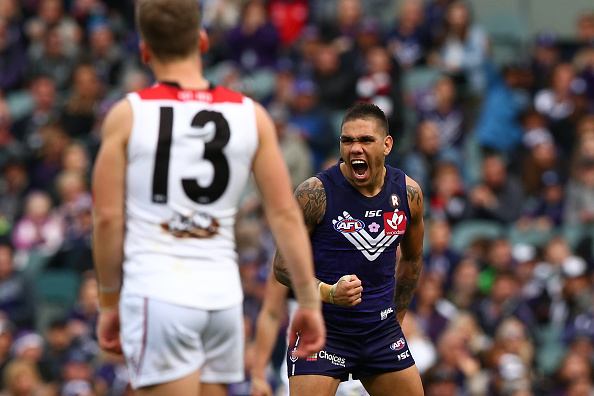 FREMANTLE forward Michael Walters says the club will be ruthless on players who do not meet team standards after Connor Blakeley was dropped for the Sunday’s round 15 clash with St Kilda. Blakely, who has been in solid form this year averaging 24 disposals, was omitted from the side after leaving the club early last Wednesday because of illness before travelling to Bunbury and Yallingup where he went surfing on Thursday. Walters said the leadership group had to take a stand. “It was a decision from the leadership group,” he said. “We need to be more ruthless and uncompromising at times and thought we – albeit Connor’s been playing some good footy – had to make an example of it and set a standard that if you do things wrong you will be punished. Walters also weighed in on Saints player Nick Riewoldt, who seduced Griffin Logue into passing him the ball, rather than Tim Membrey. Riewoldt let the ball drop to the ground and Membrey, who had just marked the ball, was brought forward to the goal line to convert his opportunity. Walters said the veteran was simply being “smart”, joking that he “might even try it this week”. “It’s really smart. As players, we know the rules. We need to abide by the rules and if you don’t give it back to the right player then it’s a definite 50,” he said. Walters had threatened to drive the Dockers back into the finals race with a dynamic performance that included six goals, 32 disposals and 12 score involvements. Ultimately the Dockers fell 12.8 (80) to 12.17 (89). “Me playing that sort of game is based on the guys around me,” Walters said.